Natural facial masks are a luxurious way to keep your skin looking it's absolute best. Once or twice a week a nutritious, deep cleansing mask gives your skin a fresh start and a good nutritional boost. This keeps your skin functioning properly and in turn you get smooth, silky glowing skin. 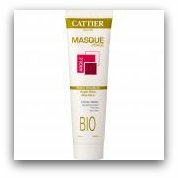 Cattier Pink Clay Facial Mask For Sensitive Skin Not only is this a gentle effective mask it is also very reasonably priced. You definately get more than your money's worth with this product. If facial masks usually irritate your sensitive skin this is the mask for you. Pink Clay is high in nutrients and minerals that brighten up skin. Shea Butter has excellent healing properties, moisturizes skin and forms a protective barrier. Peppermint acts as a an antiseptic, stimulates circulation, detoxifies, nourishes and softens skin. All Cattier products are certified natural and organic. 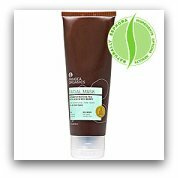 Pangea Organics Japanese Matcha Tea With Acai And Goji Berry Facial Mask This antioxidant rich mask is suitable for all skin types. Green and White Clay balance skin, Sugarcane exfoliates and unplugs pores and stimulates production of elastin and collagen. Tea extracts act as an anti inflammatory and have energizing effects, Seaweed stimulates circulation, oxygenates, firms, detoxifies, tones and soothes skin. On top of all that Jojoba and Sunflower Oil moisturize and nourish. This is another reasonably priced facial mask that leaves skin super smooth and evens out skin tone. Juice Beauty USDA Organic Rejuvenation Mask This natural mask is high in antioxidants and vitamins and is suitable for every skin type. It contains organic apple juice, lemon juice and grape juice which is what makes it high in antioxidants. Sunflower and Oilive oil deliver nutrients and moisture while Geranium Oil and Carrot Seed oil rejuvenate and help improve skin's elasticity. Organic raw cane sugar and organic honey gently exfoliate. 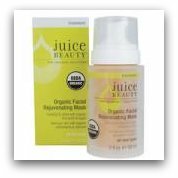 Juice Beauty USDA Organic Rejuvenation Mask contains no Parabens, Pewtroleum, Propylene, Butylene Glycol, Sodium Laurel Sulfates, Phthalates, Synthetic Dyes and Fragrances. Juice Beauty products are 100% vegetarian and all packaging is 100% biodegradable. Trilogy Purifying Masque This natural mask is suitable for all skin types, but is especially beneficial to dry and damaged skin. Kaolin Clay, Rosehip Seed Oil, Geranium Oil, and Witch Hazel Extract together replenish, refresh, moisturize, nourish, sooth and calm skin. Trilogy Purifying Masque gently exfoliates and leaves skin silky smooth. All Trilogy products and packaging are biodegradable. 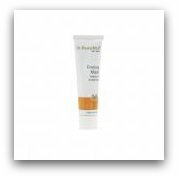 Dr.Hauschka Cleansing Clay Mask This deep cleansing and purifying mask is suitable for all skin types but is especially beneficial if you have oily or blemish prone skin. Dr.Hauschka Cleansing Clay Mask does everything. It absorbs excess oil and impurities, stimulates circulation, exfoiliates, soothes inflammation, refines pores and reduces the appearance of blemishes. All ingredients are certified natural. Dr.Hauschka Firming Mask This intensive firming treatment is suitable for all skin types but especially beneficial to aging skin. Rose Petal Extract helps restore elasticity, strengthen collagen and minimize lines. Mango Butter and Beeswax moisturize and further strengthen collagen. Avocado Oil, Olive Oil, Sweet Almond Oil, Jojoba and Althea Extract nurture and soften skin. Dr.Hauschka Firming Mask contains no Petroleum, Paraffin, Silicone, GMO's, Synthetic Dyes and Fragances. Enjoy the benefits of these natural facial masks today!